Good: Each pack is guaranteed to have an autograph card in it, rookie autographs are on-card, the base cards look nice with a close-up shot of each player and a team-colored nameplate, delivers thick cards without damage. Bad: It is extremely difficult to pull a good autograph, with a average price of $40 per pack, it is very hard to get your money's worth. Given the price, the checklist should have better names and hits. Most collectors don't want to see a bunch of common players as their hit card in such a high-end product. The Bottom Line: The guarantee of getting one autograph per pack is nice. However 2011 Topps Precision is overpriced given the autographs that are usually pulled. Great cards are extremely difficult to find. In my opinion, value-wise, this is the worst Topps football product this year. I would rather pay $100 for a pack of 2011 Topps Supreme or 2011 Topps Inception and get one hit because you are more likely to get your money's worth. The cards are very nice and thick with a glossy surface and a close-up player photo. There is a nice color contrast with the white background and team colors on the bottom of the card. 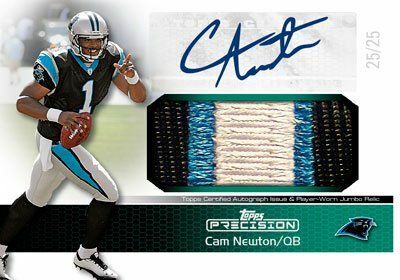 The design is very similar to 2011 Topps Triple Threads Football, but without the numbering. All cards came out in great condition. The Rookie Jersey Autographs have large swatches and plenty of room for the signature. We didn't pull any, but the silver and gold ink on-card autographs look very nice. The 2011 Topps Precision autograph set is very small, with only 36 base rookie autographs, 31 veteran autographs, and 20 retired player autographs. With only three base cards per pack and one autograph, it is very tough to put the set together. There are various numbered parallel versions of each autograph. 2011 Topps Precision is way overpriced for what you get in each box. All of the local shops around me have yet to sell all of their initial orders and are selling them at cost just to move the product. It is very difficult to pull an autograph that would even be worth the pack price. Too many hits are of common players that there isn't much demand for. The base cards look nice. It is also good to know that you will be getting an autographed card in each pack. If you are lucky enough to pull a major player hit card from this product, the product will pay for itself. Just don't hold your breath. You may have seen something like this before: loads of rookies, plenty of first-year autographs and one hit per pack. 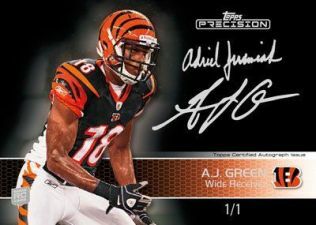 2011 Topps Precision Football might not offer a lot that's new, but it is adding to the formula with more content dedicated to current veterans and all-time legends. Like a lot of high-end products, Precision comes with either an autograph or autographed relic in every four card pack. Rookie autographs are all on-card and feature a variety of striking ink parallels. Every pack is highlighted by an autograph or autographed relic card. Up to 36 different Autographed Rookie base cards. Parallels: Red Ink (/75), Gold Ink (/50), White Ink (/25), Precision Ink (/1). All rookie autographs are on-card. Veteran Autographs include a roster of up to 31 current stars. Parallels: Red (/99), Gold (/50), Green (/25), Precision (/1). Collectors can look for up to 20 different Retired Autographs with the following parallels: Red (/25), Gold (/10) and Precision (/1). Multi-autograph cards available in the following combinations: Dual Autographs (25 cards, /25), Triple Autographs (15 cards, /15), dual-sided Quad Autographs (ten cards, /10), double-sided Six Autographs (five cards, /5) and Eight Autographed book cards (three cards, /5). Rookie Autographed Jumbo Relics carry a checklist of up to 36 cards. Parallels: Red (/50), Gold (/35), Green Patch (/25), Precision Patch (/1). Dual Rookie Autographed Patch Cards (15 cards, /5). Veteran Autographed Patch Cards (15 cards, /10). Beautiful cards but very tough to break even on, money better spent elsewhere.